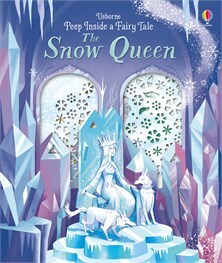 Peep through the pages of this classic story to follow Gerda on her magical journey to rescue her friend Kay from the evil Snow Queen. With delicate cutaway pages showing snowflakes and starry skies, holes to peep through and stunning illustrations by George Ermos, this is a beautiful way to introduce little children to the classic fairy tale. Honestly, the most beautiful little children's board book I have ever seen. Pictures and early readers dialogue just wonderful. This 67 Yr loved it!